(272 x 272 mm) 11.7 x 16.5 in. 'The Life Force' was a title that John used for several of his paintings and also for his retrospective exhibition in 1991 at The Old Library in Cardiff, where he wrote: "The gift of life is sacred and great love is The Life Force which carries us into Eternity." This 1976 painting was brilliant for its time and formed a pattern for the cosmology of many of his later mandalas: with its densely amorphous stellar core, and its colourful progression of a myriad spiral and coiling forms that expand outward towards the double halo of its periphery. The many comet-like curving trajectories and blue ellipses that stream outward from the pulsing heart of this mandala evoke the perspectives of deep space. In one of his journals John wrote: "A few days ago I took 'The Life Force' of 1976 to hang over the stairs in the School of Art. I want to brighten up the place, as it seems sterile. The pettiness of some of my college 'colleagues' upsets me, but most of all makes me sad. Many of them seem so spiritually empty." The great oceans discernible in the external world project an awareness of a spiritual ocean which life forms flow through. This ocean contains the residue of the 'collective unconscious' just as surely as the fossilised remains that can be found in the Pacific reveal almost a timeless life cycle. Just as surfers tap the energy of the large seas in projecting their bodies and feelings through the surging waves, so does my painting draw its energy from the great force, rendering it visible. Its presence materialises in my painting through being able to perceive the forms and colours that are tossed around in its force. In the same process of revelation I am aware of winds being revealed by observing leaves fluttering. One sees the invisible force by observing what this force moves. In this way the inanimate is able to live and breathe, and in my mind becomes inseparable from life itself. I am constantly aware of life and this becomes the unending theme. Cosmogony is balanced and enthroned in spiritual light. Seed dispersal in plants and man is echoed as the moon flickers its light across an expanse of sea. I join in with the image and the word. Man's presence in this world often deludes him into believing that he is orchestrating life; but this is not so. I feel that the sheer joy of experiencing a comparatively short life span gives the human the eternal happiness of knowing that magical forces have revealed a love force which is so powerful that size is irrelevant, time is irrelevant, even what form life takes is irrelevant. One has a vision of pure love which human intelligence reacts to by being dumbstruck. My paintings are manifestations of great love. Those who can feel love and give love will respond to my paintings. Intellect is irrelevant, only feelings and instincts come into it. My painting is an expression of my feelings towards life. Life is a magical gift. 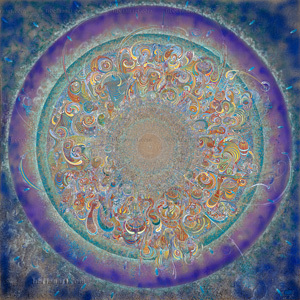 My painting is an outpouring of great love and passion, and evokes the Life Force itself. Cosmogony and spirituality are at the heart of my work. Nature is the magic oracle and my values have a timelessness, which are elements in a great universal truth. Modern man is strangled by his technology. My roots are primeval.